Welcome to the November 21, 2018 edition of ACM TechNews, providing timely information for IT professionals three times a week. Please note: In observance of the U.S. Thanksgiving holiday, TechNews will not publish Friday, Nov. 23. Publication will resume Monday, Nov. 26. Researchers from Oak Ridge National Laboratory (ORNL) and Lawrence Berkeley National Laboratory (Berkeley Lab) have jointly been awarded ACM's Gordon Bell Prize for outstanding work in computer science. The ORNL team won in the sustained performance category for a new algorithm called the Custom Correlation Coefficient method (CoMeT), which compares variations of the same genes in a chosen population. 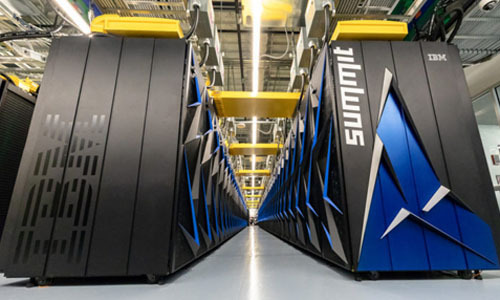 The researchers used the Summit supercomputer to undertake analysis and comparison of millions of genomes in short periods of time. The Berkeley Lab team broke the exascale barrier on Summit when they achieved a peak speed of 1.13 exaops while using a deep learning tool to identify extreme weather patterns from high-resolution climate models. The team's application of Summit to process large volumes of meteorological data represents one of the first successes of scaling a deep learning application to high-performance computing (HPC). Facebook CEO Mark Zuckerberg's testimony before Congress earlier this year highlighted how poorly informed U.S. lawmakers are about how modern technology actually works. The hearing inspired Harvard Kennedy School's Dipayan Ghosh and former U.S. Federal Communications Commission chairman Tom Wheeler to launch a new artificial intelligence (AI) policy initiative focusing on expanding the legal and academic scholarship around AI ethics and regulation. The initiative also will host a boot camp to help Congressional representatives learn more about the technology, with the goal of helping policymakers be better equipped to effectively regulate and guide the growing impact of AI on society. Ghosh and Wheeler have asked about 30 leading experts in computer science, philosophy, economics, and other fields to express their thoughts on discrimination, fairness, transparency, and accountability in AI. Technology with the best chances of revolutionizing the housing industry are those developed over prolonged periods with trial and error. Examples showing promise despite setbacks include robotic parking systems. These vending machine-like garages feature a computer to coordinate turntables, robotic arms, and a network of safeguards to guarantee vehicles are transported undamaged. One installation captures three-dimensional photos of a car's dimensions to ensure it is assigned adequate space, and learns user habits so it can shuffle vehicles to more convenient spots for removal. Carnegie Mellon University (CMU) and Microsoft will collaborate to further edge computing via CMU's Living Edge Laboratory, a testbed for applications that produce large datasets and require intense processing with near-instant response times. Microsoft will supply the Living Edge Lab with edge computing products such as Azure Data Box Edge, Azure Stack with Intel, and Microsoft Azure credits, providing access to cloud services like artificial intelligence (AI), storage, and the Internet of Things. Said Microsoft's Tad Brockway, "By moving AI models and computing closer to the source, we can surface real-time insights in scenarios where milliseconds make a critical difference, and in remote areas where 'real time' has not been possible." The lab's envisioned edge-computing applications include real-time assistive tools to help visually impaired people detect nearby objects or people. Video feeds of a stereoscopic camera on a user are sent to a nearby cloudlet, and real-time video analytics is used to detect obstacles, with data conveyed back to the user via vibrations. More than 90% of U.S. cities said they are considering the Internet of Things (IoT) in their information technology (IT) strategic plans, up from 61% in 2015, according to the Center for Digital Government's 2018 Digital Cities survey. Local-government IoT projects of note include smart street light upgrades, where a municipality will replace inefficient lighting with dimmable light-emitting diodes with adjustable color and connectivity hardware for remote control. Although respondents' interest in IoT may reflect their consideration of its use rather than active testing and deployment, there are clear examples of the technology being used in real-world settings. For example, Coral Gables, FL's IT strategic plan outlines several projects the city has implemented since 2017, such as air quality sensors, pedestrian counters, smart street lights, and online dashboards to aggregate the data together. Northeastern University researchers are re-examining computer models used to predict the spread of epidemics and determine where to distribute vaccines. The team is focusing on the assumption that in early stages of an outbreak, the average number of new cases caused by each infected person is relatively consistent. The researchers have analyzed networks to build more realistic models, examining the differences between types of social networks—like workplaces, households, and communities—and layering them into a larger model. The team expected each layer to have a unique basic reproductive number, but the number used in the past does not work in realistic situations. Instead, scientists can use the data from real outbreaks as they occur to determine each day's reproductive number. Said Northeastern's Alessandro Vespignani, "You can use that number to produce better simulations, better forecasts, and have more grip on the actual spread of the disease in the population, without making guesses about what's happening." Singapore's government has allocated $10.19 million over three years to finance development of smart estates and modern technology, including energy-efficient applications. The Infocomm Media Development Authority (IMDA) has partnered with Ascendas-Singbridge Group (ASB) and local industrial estate provider JTC to support pilots at various ASB and JTC locales. IMDA said the overarching goal is enabling technology development to support "hyper-connected smart estates of tomorrow" that will "provide a seamless experience for the community and create new growth opportunities for enterprises." Meanwhile, a local consortium led by the Nanyang Technological University and NXP Semiconductor was established in 2017 to develop and test smart mobility technologies, including smart traffic systems, automated video analysis, and environmental sensors. This group was tasked with harnessing wireless communication standards for vehicular use, vehicle-to-everything. Nearly 70% of global airport operators polled by the SITA technology multinational said they plan to boost their technology budget and invest heavily in devices that allow travelers to check in, drop off luggage, and board without dealing with a person. 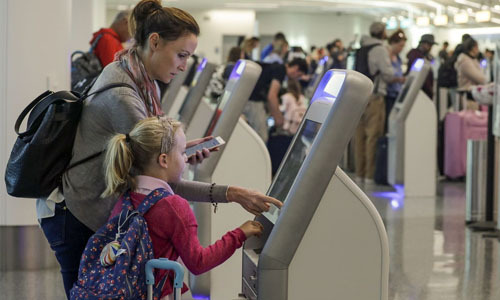 Currently, 88% of airports have kiosks that let fliers check in without going to an airline employee, and 95% expect to deploy these kiosks in the next three years. SITA also said 78% of airports plan to have unassisted bag drop-off locations by 2021, up from about 50% now. More airports also plan to implement wait-time monitoring technology that updates travelers via smartphones or airport displays; 42% of airports now have this technology, up from 31% in 2017. Solutions designed to let passengers board without checking with an airline employee may proliferate as more airports invest in ways of identifying fliers using biometrics, according to the survey. Vanderbilt University's Institute for Software Integrated Systems has unveiled the latest version of the Cyber-Physical Systems Virtual Organization Portal, a one-stop shop to find research results that could improve relationships between humans, computers, and the physical world. The National Science Foundation funded the effort with a grant to create a virtual home for the large cyber-physical systems research community and for research artifacts such as software, data, and tools. The goal was to improve the impact of research by guaranteeing these artifacts can easily be found, replicated, and transitioned after the projects are completed; the latest portal version features tools and design studios that researchers and practitioners can access and explore via Web interfaces. Said Vanderbilt's Janos Sztipanovits, "By removing the technical barriers for disseminating and making results, tools, and design studios accessible, researchers can have much greater success in achieving tangible impact with their work. We're in the process of changing a culture." University of California, Berkeley researchers demonstrated that a few self-driving cars can prevent traffic jams, and in some cases double the average speed of surrounding vehicles. The team used a video game-style interface to control simulated cars on multiple virtual roadways; in each scenario, the researchers tested four algorithms that used reinforcement learning to learn how to navigate the streets. However, the algorithms can still be improved, which is why the team is making its programs public. If other researchers think they have a more advanced algorithm, they can use this framework to test new ideas. 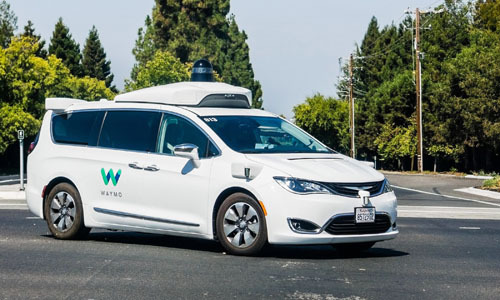 It is unknown when self-driving cars will become commonplace in real life, but some of the new techniques being developed could be applied to modern vehicles. For example, patterns of traffic-reducing acceleration and breaking could be used by adaptive cruise control systems in cars, saving time, gas, and possibly lives. The U.S. National Aeronautics and Space Administration's Jet Propulsion Laboratory partnered with Autodesk to create a new landing craft using generative design. Autodesk said, "Designers or engineers input design goals into generative design software, along with parameters such as materials, manufacturing methods, and cost constraints." The software can rapidly develop design options and learn from its own work. 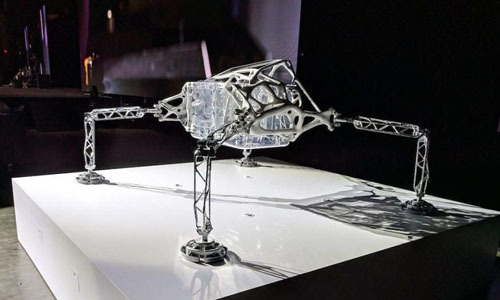 The concept lander features four legs and an organic-looking body, with the physical model fabricated via three-dimensional printing, computer numerical controlled milling, and casting. The lightweight but strong craft could be deployed to worlds beyond Mars in the exploration for life in the solar system. As part of an initiative to reduce the cost of Internet of Things devices for incorporation into consumer products, U.K.-based Arm is designing the first machine learning-enabled flexible plastic sensor chip to detect body odor. The chip features sensor arrays, a machine-learning processor, and an interface assembled on a thin plastic film, with a battery and display possibly added later. Arm designed naive Bayes classifier-based machine learning circuitry, while PragmatIC produced amorphous-oxide-based flexible electronics, near-field communication, and radio-frequency identification chips; the University of Manchester contributed a plastic gas-sensing solution and a model of human olfactory perception, and Unilever loaned its consumer-products expertise and its odor-testing laboratory. The sensor arrays were composed of field-effect transistors made from chemically modified organic semiconductors, refined to respond to distinct gaseous analytes. The arrays' collective response, read by the machine learning component, signals the strength of the wearer's armpit odor. AppZen has developed an artificial intelligence program that can identify dubious work expense claims and educate employees about travel and expense policies. The company, which touts Amazon, IBM, Salesforce.com, and Comcast as users, estimated that it has saved its clients $40 million in fraudulent expenses. AppZen can audit 100% of claims in real time by running receipts through an algorithm that looks for duplication, discrepancies, or inflated expenses. The program reimburses legitimate employee expenses on the same day and kicks back any suspicious claims to human auditors for further investigation. 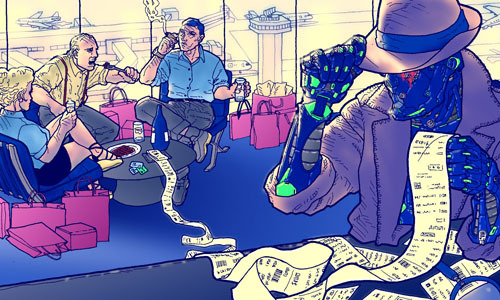 In addition, the algorithm can compare the average cost of a flight from New York to Chicago against the amount expensed, and flag it if the price seems out of line for other similar flights that day.